Tons of energy, a healthy weight, fewer allergies and just all-around better health and vitality—these are just a few of the reasons that raw foods are a great addition to dogs’ (and people’s!) diets. Yet you may have wondered how to work raw food into your dog’s routine, or thought it’s too expensive or inconvenient to feed raw. Fortunately, Sidewalk Dog has the inside line on a canine raw food expert—and she can help dispel some of the confusion and give you the real raw deal. When it comes to knowing her kibble (and just about everything else there is to know about doggie nutrition), Dawn Peterson Cobb is the top dog. 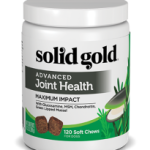 As founder and owner of Solid Gold Northland, a supplier of natural and holistic products for pets, Dawn is passionate about the power of the right diet to boost dogs’ health and wellness. 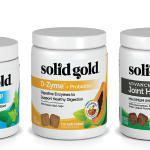 Sidewalk Dog is proud to partner with Solid Gold Northland and share Dawn’s expertise with you. Once you and your dog are happy with your kibble and SeaMeal, adding in some raw food for variety is the next step. “It’s just like in our own diets,” Dawn explains. “We like a variety of foods.” Contrary to what you might think, going raw isn’t an all-or-nothing proposition. Dawn recommends replacing some of the kibble with a raw food product a few times a week. Dawn recommends thawing out portions of the raw food as needed—keeping it frozen helps preserve the valuable vitamins and enzymes. While you can go 100% raw, to keep costs down you can also make that five-pound bag last two weeks, or a month. “Any amount of raw will help boost your pet’s health. We feel good when we eat well and incorporate fresh foods into our diets; this is all about wanting our dogs to be well fed—and be well,” she says. Feeding Solid Gold kibble, the SeaMeal supplement and raw food for variety have certainly made a difference for Dawn’s own dog, a maltese-papllion from Underdog Rescue named Lily. “When she first came to me, she wasn’t very interested in food,” Dawn remembers. “Now, she does a little happy dance when I set down her bowl!” It’s a testament to the power of healthy food and going raw—and seeing is believing. Have questions about raw food and what it can do for your doggie? Dawn and Solid Gold Northland welcome your questions—really! Give them a call at 612-729-7748.